This is a fairly small project I made to help organize my electronics workbench. Those of you familiar with electronics labs should recognize it immediately, except that the ones you've seen are all made of metal, rather than wood. 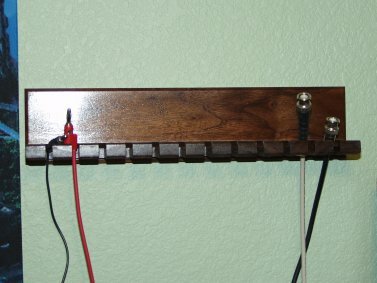 It's called a "test lead holder", and it's just a simple item with horizontally-jutting "fingers"; test leads are placed in the slits to hold them in an organized fashion. I spent a fair amount of time at my new router table making this project. 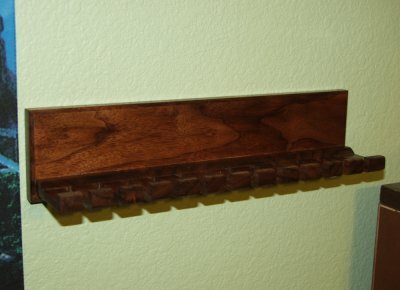 The back piece was fairly simple, consisting of a piece of walnut with 45-degree chamfers on all sides, and a dovetail groove cut along its length in the face. The second piece required more work; because I had to orient the wood's grain along the direction of the slits, and my board was fairly narrow, I had to glue three pieces together to match the length of the back piece. I cut the matching sliding dovetail on one side using the router table so that it could slide into the groove on the back piece. I also used the router, with a straight bit, to cut out a recessed area on the top, so that the fronts of the fingers would have a lip to hold the test leads in place. I also cut several chamfers to match the style of the back piece. This project was made of black walnut, and thanks to the wood's already-rich color, no stain was needed. For the finish, I used one coat of boiled linseed oil thinned 1:1 with mineral spirits, and then several coats of polyurethane thinned 2:1 with mineral spirits, both of these wiped on. To hold this project to the wall, the router table was used again, this time with a "keyhole" bit. This puts a groove in the back with a recessed space behind it, so that a screw head will be held inside it. 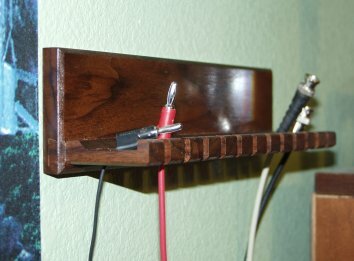 I attached two screws using wall anchors, and mounted the test lead holder to these.